A recent job at a large office building. Whether your business is a small shop, a popular local restaurant, a commercial warehouse, or a large office complex, your security is our top priority. 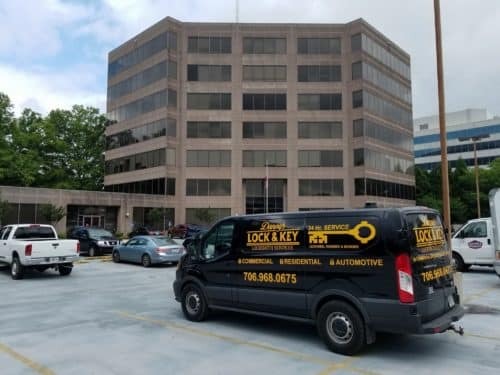 Our highly-trained and certified locksmiths are available to help you with all your commercial locksmith needs—even on weekends or in the middle of the night. If you’ve accidentally locked yourself out of your office or shop, or you need new high-security locks installed, give us a call. Danny’s Lock & Key is a mobile locksmith business and we will meet you on site at a time that is convenient for you. Another recent job at a local business. If you need a service that is not mentioned here, give us a call. We will do what we can to help you out. If you have a locksmith emergency at your business you can call us 24/7 for fast, convenient help. 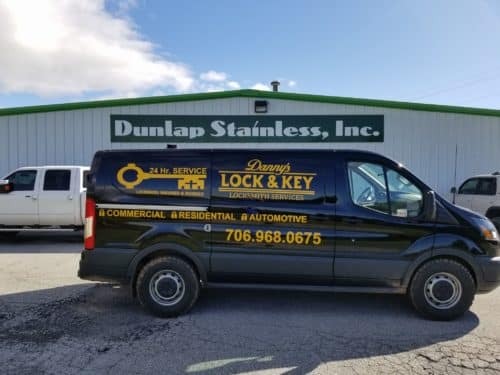 Our fully-stocked locksmith vans carry all the necessary tools and equipment needed to help you out in Habersham County, White County, Banks County, Hall County, Stephens County and anywhere else in and around Northeast, Georgia.